Like most people, I grew up eating canned cranberry sauce. You know, the jellied stuff that came out of the can in the shape of the can and was served on a place, sliced, like ham! I always ate jellied, out the can, cranberry sauce with Thanksgiving and Christmas dinner, always. It was what my mom served as part of our holiday dinners so when I grew up and started fixing my own holiday dinners, I always had that can of cranberry sauce in my shopping cart. Tradition is a wonderful and interesting thing! Tart, sweet and goes great with your holiday meal. If you love cranberries, you'll find yourself making an excuse to serve and eat this cranberry sauce year round. Delicious! 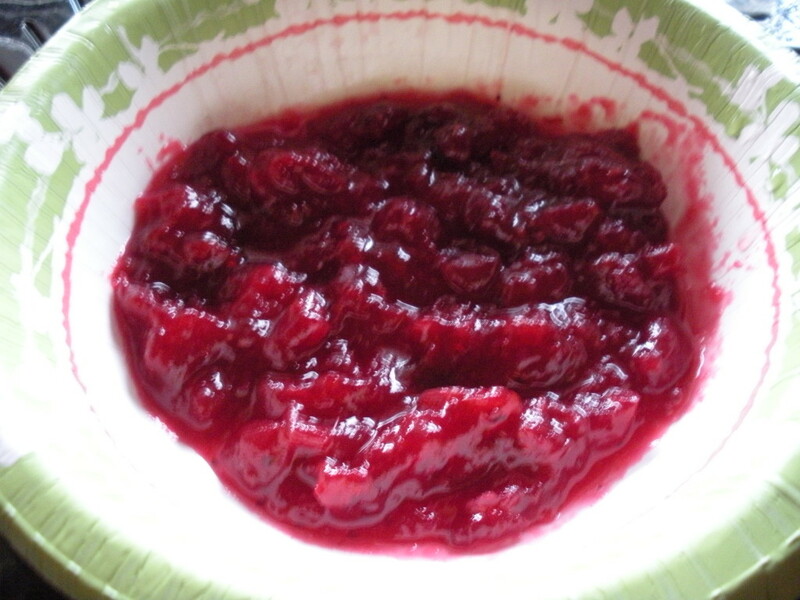 Easy Cranberry Sauce – So Good! Previous Post: « Pigs Feet, Lasagna and Neck Bones – Oh My! Thank you – Sounds delicious- Im going to try this. Hi Phyl, this is really good cranberry sauce. I made it last year for our family-reunion Thanksgiving if you got to try any! Phyl, what you should really try is the sweet potato butter on hot biscuits. It’s the jam, literally and figuratively! ? I made a batch a couple weeks ago and put it in the freezer for Christmas morning breakfast. Shrimp & grits with eggs to order & biscuits and sweet potato butter! Yum! I’m also going to do a salmon patty with fried potatoes & onions and eggs to order breakfast. I’ll make it another morning during Christmas week, I’ll make biscuits and break out the sweet potato butter again! It’s really good Phyl, you’re going to love it! Don’t let the picture throw you off, I just need to take a better one! It really looks like apple butter but tastes so much better!